A/ Kiwip Plan: The watch costs €149 incl. tax and the service charges are €9.99 incl. tax per month with a 12 month commitment. The plan is exclusively reserved for the KiwipWatch and is only available for residents in mainland France. 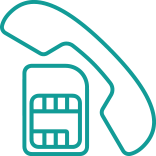 The service charges include all unlimited: Incoming and outgoing calls, voice messages, receipt of text messages, Voice, data, geolocation in mainland France, Monaco and Europe zone 1. The parent app can be downloaded free of charge onto IOS and Android devices. *Europe zone 1: Ireland, United Kingdom, Germany, Belgium, the Netherlands, Luxembourg, Switzerland, Italy, Spain, Portugal. Warning:The telephone numbers allocated will be 14 digits (ARCEP decisions n ° 2012-0855 of July 17, 2012 (http://www.arcep.fr/uploads/tx_gsavis/12-0855.pdf) and n ° 2015-1295 of the October 22, 2015 (http://www.arcep.fr/uploads/tx_gsavis/15-1295.pdf). B/ Operator Free offer: The watch costs €149 incl. tax and you sign up to a plan of your choice with a compatible national operator (in France: Bouygues Telecom/Orange/Sfr/Free). If you choose the Free Operator offer, and that your offer includes enough voice and data to sue the watch. We recommend a minimum of 50 Mb for your Data plan. You should also pay attention to the watch’s terms and conditions of use in case of roaming if you travel outside of France. Warning:the twin SIM cards associated with a bundle are not compatible with the KiwipWatch watch, as are the prepaid cards. You need a dedicated package. The Kiwip plan is only available on www.kiwip.fr for residents of mainland France. It’s an unlimited plan (voice & data) at €9.99/month with a 12 month commitment. The SIM card is free and sent free of charge when you sign up. It can only be used with the KiwipWatch. In partnership with Bouygues Telecom, the Kiwip plan is unlimited (voice & data) in France, Monaco and Europe Zone 1*: It includes call, voice messages, geolocation, data protection on our secure French server and access to the mobile application. The parent app can be downloaded free of charge on IOS and Android devices. Any use in other countries that are not included in the offer will be billed outside of your plan according to the pricing agreed on ordering. and want to sign up to the plan” section. Follow the instructions shown to buy it. You can also manage the details of your plan in your customer area. The plan will debited each month on the plan subscription date via the payment method used. Note: The Kiwip plan SIM card is an anti-theft SIM card. It will be locked to the first device it is placed in. This means that any attempt to insert the Kiwip SIM card into another device (other KiwipWatch, smartphone, etc.) will make it obsolete. Please make sure you deactivate the Pin Code for you SIM card before inserting it into your KiwipWatch. 1- Insert the Nano SIM card into your smartphone then in settings, disable the PIN code request. 2- Go to the mobile operator store where you purchased the SIM card and ask them to do this for you. Once the PIN code has been disabled, you can use you Operator Free SIM card in the KiwipWatch. Warning: The twin SIM cards associated with a phone plan are not compatible with the KiwipWatch. You need a dedicated phone plan. Enter the verification code received by SMS. Turn your watch on and make sure you have a good network signal and check the time and date. Enter the activation code located underneath the QR code in the watch. Congratulations, your KiwipWatch and your smartphone are now connected! On the QR code, quickly press the top button 10 times then the button at the bottom of the watch once and the number will display at the bottom of the screen. Scroll down the screen if necessary. You should repeat step 2 for each watch by selecting the “Add/change watch” function in the main menu of your mobile application. We recommend you move to another place with good network coverage before attempting synchronisation again. The KiwipWatch has a colour touch screen. Access the sub-menus by sliding your finger from top to bottom and left to right. To select a displayed element, simply press the touch screen. To go back, press the button at the bottom on the side of the watch casing. Advice: Protect the screen of your KiwipWatch with an adjustable, flexible protective cover (available soon in our store). Press and hold the home screen for 2 seconds to display the different types of time display. Your child will then be able to choose the one they like best. By sliding your finger from top to bottom on the watch screen, you can control the brightness and volume by simply touching the screen. Reducing the volume to its lowest level enables the vibrate mode. Note: in vibrate mode, the watch does not emit an audible “Low battery” alert. The watch can contain up to 50 contacts. Only contacts authorised by the Administrator can communicate with the watch. If one of the authorised contacts wants to receive voice messages or send voice or text messages to the child’s watch, they must download the KiwipWatch parent app and create an account. They must then scan the watch’s QR code (or enter the watch’s IMEI number via the small pencil icon in the top right corner). When they have been accepted by the administrator, the contact will be able to send and receive messages. The child’s “Best Friend” contacts are also authorised contacts. However, the Administrator can delete them if necessary. To answer call, simply swipe your finger from left to right without releasing. In the “Chat” menu, select your contact then record your message by holding down the “Hold to talk” icon. Release the button to send your message. If the message fails to send, check the network status on your watch. If the problem persists, visit the Troubleshooting section. Note: The watch can only send messages to contacts that have the mobile application or best friend contacts. Your child can synchronise with their friends who have a KiwipWatch. To do that, two children must go to the “Best Friend” menu at the same time and follow the instructions provided. The watches should not be more than 20 cm apart to ensure synchronisation. They can now call each other, chat and track their respective physical activity via the ranking. The watch Administrator will receive a notification on their application informing them that a new friend has been added and which they can delete if necessary. The watch has an activity sensor. The child can monitor the number of points they have and see their position in the general ranking. The more the child moves, the more points they collect which will make Kiwipi grow! On the application, the administrator can keep track of the child’s physical activity via the “Activity tracking” menu. An award notification can be sent every week. The points earned are updated every hour and reset to zero every day at midnight. The watch’s internal counter restarts but the points are stored in the week’s history. The watch restarts the weekly history every Sunday at midnight. Activating the SOS mode enables the child to discreetly call all the trusted contacts in the list one after the other until one of them picks up. To add a person to alert in the event of an emergency, go to that contact shored in the mobile application. To enable SOS mode, the child must press and hold the top button on the side of the watch casing for 3 seconds. On the application, the Administrator receives a notification as well as the GPS location from where the message was triggered. If it is available, “Streetview” enables you to see the child’s surroundings, with 360° images. *Note: If the call goes to an answering machine, the watch assumes that the call has been answered and the loop is broken. The KiwipWatch becomes a simple watch when in class mode. Only the geolocation and SOS functions remain enabled. In class mode, your child will only be able to see the time, adjust the volume and brightness and change the wallpaper. No contacts can call the watch or send messages. Sent messages will however be available when class mode is disabled. To find out how to enable class mode, go to this section in the “Mobile application” category. Pour savoir comment activer le mode classe, rendez-vous dans cette rubrique, dans la catégorie “L’application mobile”. The watch is water resistant with a protection rating of 65 (splashes, light rain, sand and, dust). That means that it cannot be submerged in water (bath, swimming pool, etc.) or come into prolonged contact with a jet of water. You can set up different types of alarms via the application in the” Child Alarms” menu. The weather is updated every 30 seconds and uses the nearest weather station at least one kilometre from the position of the watch. The battery operating life is one day on average. Use the Kiwip magnetic USB cable provided to charge the watch. When the battery is being charged, the bar advances. The watch is fully charged when the bar is full. Think about charging the battery when you see the “Low battery” notification. Charge your device using the charger provided or one you have acquired from Kiwip Technologies (available on kiwip.fr). Use of an unsuitable charger may damage your device. Exposing the device to intense heat reduces the battery operating life. We recommend putting the watch on charge every evening so that it becomes a ritual for the child and they can take full advantage of the battery life. Why isn’t the battery charging? If your battery is not charging properly, this may be because the watch’s charging contacts or the charging cable are dirty. •	Use a tooth-pick or tooth-brush moistened with alcohol. •	Do not scrape the contacts with a metal brush or any other metal object as that could damage the plating and lead to corrosion. •	If you are using a toothbrush, wipe it with a cloth or tissue before charging the device. •	Moisten a cotton-bud with alcohol and gently dab the pins. •	Make sure not to leave any pieces of cotton wool on the pins. If the crossed out network icon appears, verify the network status then make sure that the SIM card is correctly inserted and restart the watch. The time and date on your KiwipWatch are automatically set. If the time is incorrect, you can try switching the watch off and on again*, then check the network status and make sure that your KiwipWatch has updated and perform the update if that is not the case. You can restart* the watch remotely from the application using the “Reboot” function in the watch settings. If necessary, you can also restore the factory settings via the application. The functions will permanently delete all the data stored in the watch. *To reboot, the “Do not allow child to turn watch off” option must be disabled. To ensure quality, Kiwip offers regular software updates for your KiwipWatch as well as updates for the mobile application. 8. The watch will restart automatically when the update is complete. Congratulations, your watch is updated! We guarantee the proper functioning of the watch for a period of 2 years. However, water damage, broken screen, loss or theft are not included. Create your customer account and activate your 2-year guarantee via our website in the “My Account” section. If your watch is lost or stolen, you could try to find it using the geolocation function. If this does not work because the watch is turned off, contact us and we will tell you the last known position of your device. We also recommend that you contact your third-party or household insurers if the watch is not found. Here are some video links to help you set your watch up. You can choose the language of the watch by sliding down twice from the main screen of your KiwipWatch. Once on the “Language” screen, tap once and then choose the desired language. Enabling Energy Saver mode (available in the watch settings on your app) allows you to save your battery for longer. Nevertheless, the activation of this mode implies a less precise geolocation. Indeed, in normal times the geolocation is possible thanks to 4 different technologies, which ensures a position as accurate as possible. In energy saving mode, the triangulation by wifi spots is used. In rural areas or in the white zone, geolocation can be imprecise. You only need one administrator account to manage KiwipWatch. The User becomes the administrator by default when they perform the first synchronisation between the watch and smartphone. You can however then appoint another administrator. To do that, the new appointed person must download the application, scan the QR code of the watch and then be accepted by the existing administrator in the “New” section of the application. Then go the “Contacts” and select the new administrator. Then click on the blue icon that says “Change administrator”. The new administrator can make you the administrator again by following the same procedure if required. For every contact who has created a user account and synchronised with the watch, the administrator can decide whether or not to they can see the watch’s location and whether or not they are authorised to receive notifications. To do that, enable the “Authorise geolocation” option and/or “Receive alerts” in the corresponding “Contacts” file. A- Access child information by clicking twice on the avatar or photo in the top left to access information about the child. B- You will be able to see the watch number on the third line. Note: If the watch number does not appear in the child information, the watch is not connected to the server. Check with your operator to make sure the SIM card is active (this may take up to 24 hours), as well as the DATA option of the watch plan that you have signed up to. Geolocation is available via the “Location” screen on the application. If the watch has no satellite connection (for example when it is inside a building), it uses the power-saving mode location until it manages to connect to the satellites. The user will not notice this change. If the watch’s location is inaccurate by more than 200m, the location is not sent to the application. If the geolocation is not updated automatically, press the blue target to update it manually. Geolocation also allows you to define safe zones and routes as well as the local time in each country and the weather (updated every 30 minutes). If the geolocation function is not working properly, your watch or application may need to be updated. D- Specify the time periods according to your child’s timetable. Enable the days by sliding the bar corresponding to the day from left to right and then click “Submit”. E- To disable a certain day or to disable Class Mode Management, simply slide the bar from right to left. After the deactivation has been confirmed, the operation has been performed. *Make sure that the watch is turned on when enabling or disabling Class Mode. To ensure compliance with French and international regulation bodies, but also to protect the private life and personal data of users, Kiwip is regularly required to update the functions of its products. Only those who have downloaded the app can communicate using voice and text messages via the KiwipWatch. To do that, select “Contacts” in the application, click on the child’s contact, then choose “Message” in the bottom right of the screen. You can send a voice or text message by selecting the “keyboard” icon in the bottom left of the screen. 4. A notification confirming this was successful appears on the screen. 1. If the update for your KiwipWatch Parent App is not suggested automatically, go to your store (Google Play or Apple Store). The store will tell you if an update is available. 2. Launch the update via the store and let it progress to the end. Congratulations, your watch has been updated! You can also uninstall then reinstall the KiwipWatch application. The update will be included automatically. 1 – The first thing to do is to create a new account with your smartphone number to you (future administrator) and to synchronize with the watch. 2- Reconnect to your application with the number of the watch and password indicated the first time and accept yourself as a new contact. 3- Give yourself the power of administration in the contact section of your application, by pressing the small blue rectangle that will appear next to your new contact account created. 4- Once you have switched your administrator authority to the future administrator number, log out. 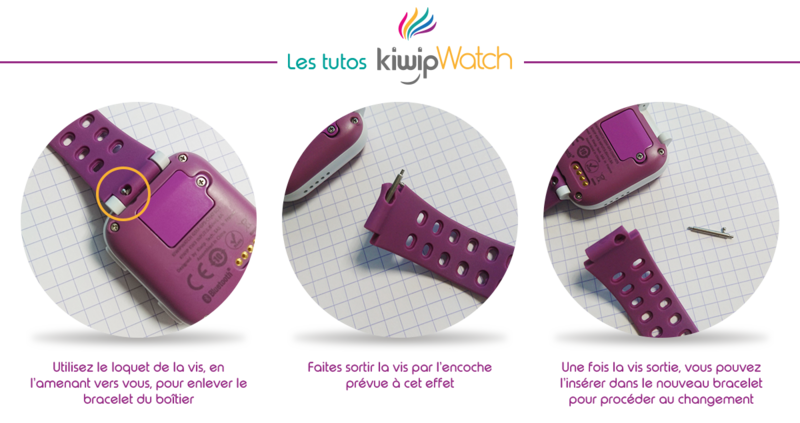 5- Reconnect from your smartphone and number and delete the account of the watch created by mistake contacts allowed to join your child. 6- Finally, reconnect to the account of the watch created by mistake and dissociate yourself from the watch (in the contacts, on the contact card of the watch) before disconnecting. There you go ! The change is over. NB: In the case of a line change of the administrator, the procedure is the same between the old number and the new number. You can choose the language of your application, go to the menu of the application then go to the “Settings” and choose the language chosen in the category “Language”.